Matti Pikkujämsä (b. 1976) is an artist and illustrator living and working in Helsinki, Finland. He is known for his portrait project, as well as making numerous children’s book illustrations for various publishers in Finland and Japan. He also works on pattern design for several fashion brands. He was awarded Rudolf Koivu prize in 2013 and Finnish State Prize for Illustration in 2015. 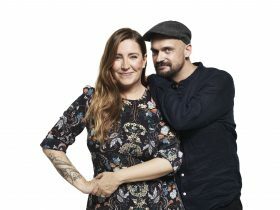 Picture by Numi Nummelin 2018.